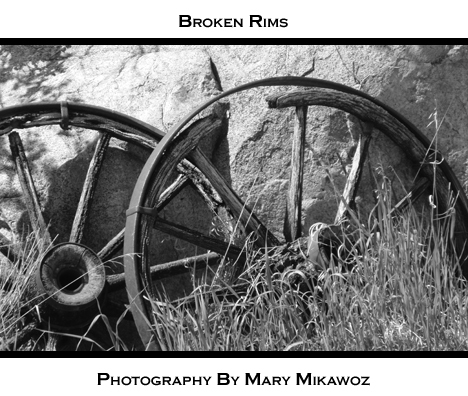 This is a black and white photo of old broken rims. They may even be off of the famous Red River Carts. Red River Carts or charettes in French, were used during the fur trade in the Red River area. One of the first carts was used in Pembina, North Dakota and expanded from there. 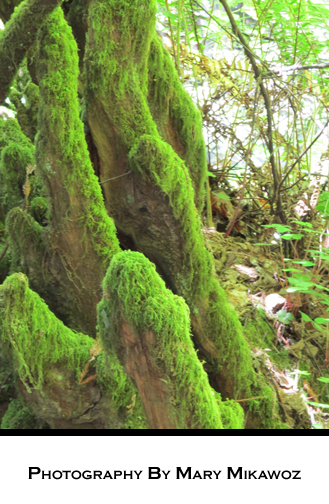 They were mainly pulled by oxen but also horses and mules. The cart was so buoyant that it could float over streams yet strong enough to carry 1000 pounds. One reason that the famous roads Portage Avenue and Main Street in Winnipeg, Manitoba are so large is because these Red River Carts were wide and so the streets today are wide and open compared to most other downtown areas around the world. This is a photo of the famous Catholic Church called Saints Paul and Peter Church in the North Beach area of San Francisco. You get the spires as a quick image as I passed along one of the famous bus tours around the city. 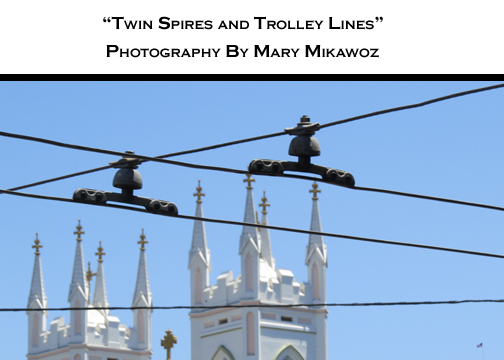 I love the trolley lines finding them interesting how they intersect and work. I remember being younger and enjoying the electrical buses that use to run up and down Corydon Avenue in Winnipeg. They often lost their footing on the cable as they came around the bend and so I would enjoy sitting there watching them putting the cable back on the line. I miss those electrical buses and meanwhile they were good for the environment but we replaced them in the name of technological advancement.